This massive supplement clocks in at 64 pages, 1 page front cover, 1 page editorial, 1 page ToC, 1 page foreword, 1 page SRD, 1 page back cover, leaving us with 58 pages of content, so let’s take a look! So, this book has a rather impressive goal – making vehicle creation truly modular. Vehicle, for this purpose, does not mean using Small or Tiny spacecrafts as submersibles, etc. The book focuses on vehicles that are somewhat “smaller”, and rules-wise, use hit point mechanics as opposed to hull points. Each size is assigned a numeric value – this is important, and though it is later referred to as such, the section that establishes it never explicitly states this, so let me do that for you: This numeric value would be the “size level,” and it determines the maximum number of modifications you can fit on the vehicle. They are, as such, susceptible to being destroyed by hit point damage causing spells and effects. But does it succeed? Well, we begin by choosing an idea – after this, we choose the array that suits best the body of the design. Each body has a base cost per tier, and certain modifications are added after body selection. For example, if you want a hover tank, you first choose tank, then add the hover modification. These are jutted down on a piece of paper…or on the handy vehicle creation work sheet included! Now that is foresight, ladies and gentlemen! Nice! This step encompasses determining the size of the vehicle in question and choosing from 12 array types that include bikes, flying vehicles, walkers, trucks, etc. Vehicles come in 20 levels, with regular and maximum speed on a character scale, while the third speed rating denotes per hour movement. EAC and KAC ratings are provided per level and seem sensible for the respective vehicle types. Damage that exceeds the hardness of the vehicle is applied to a random passenger, and cover provided, if any, is similarly noted. Cool: Modifiers for Piloting at full speed are and regular speed are provided per level. There are a couple of minor editing glitches regarding plural “s,” missing prepositions and the like here, but I found the section to be pretty easy to grasp, though the pdf does sometimes become a bit inconsistent regarding level/tier, using them interchangeably – here, a revision of terminology has obviously not been implemented to the fullest extent. Didactically, there are two components that first feel a bit odd: We note passengers, but there is no passenger stat per se included in the tables; instead, each vehicle body type notes the passengers in the beginning; this is slightly counterintuitive, since the previous rules explained by the pdf all refer to table entries. Secondly, vehicles get a Ram DC. This is 10 + tier of the vehicle (should probably be item level, analogue to SFRPG’s core rules) for collision, with damage governed by vehicle size. These are more unified and based, as a default, on d6s. Okay, got that. The Attack DC is equal to the “vehicle in DC modified by add-ons” – I stumbled over this “vehicle in DC” at first, but since it’s the same paragraph, I’m pretty confident, that the DC to ram it is meant. The presentation of this part of the rules could be slightly clearer. Now, this whole section becomes clearer once you reread the collision section in the SFRPG core book, but in a pdf that otherwise does a really good job explaining its rules, this stood out to me. As a nitpick, the collision damage type should be noted as bludgeoning. The section also provides a couple of examples for this step of vehicle creation. A minor complaint here: Not all examples provided come with formatting of the stats, lacking bolding of elements. The material is functional, though. Visual representations of the respective vehicles bodies are provided. As hinted at by the presence of modifications, which can range from pretty cosmetic to being complete overhauls of the base body – adding Military to a bike, for example, might well make it behave more like a Batman-Bike style 2-wheeled tank. All modification costs are added and then modify the cost ”per tier” – should probably be item level. The list of modifications is extensive and amazing: From advanced, really good materials to piloting an aged craft, armors of varying degrees, being capable of transporting other vehicles or mechas. These modifications are given in base percentages for the most part, with some offering a fixed cost per item level. Here, the book does get the distinction level/tier right – thankfully, otherwise it’d become really confusing: You see, the modifications do include starship materials and thruster modifications, allowing for the upgrade to essentially pseudo-starships, with hull points and starship options. Big kudos for attempting this step and incorporating it into the system! This is not where the system stops, btw. : After the modifications, we come to the add-ons, which serve to distinguish vehicle functionality. These include additional passenger compartments, auto-piloting units, more hit points, more limbs, cargo spaces, adding ship or mecha expansion bays, applying ship weaponry. A vehicle can add its “size plus one add-on” – here, we once more refer to the numeric value that was deemed “size level” in the modification chapter, in case you’re wondering. Add-on bonuses, cost-wise, are added to the total cost, after modifications per level have been taken into account. Finally, you can add finer details – gun ports, HUDs, sunroofs or luxury details. Et voilà! The pdf also presents 6 feats and 4 piloting actions, which have in common that they disregard standard formatting for the like in pretty much every way possible – they are presented as though in an abbreviated table. The rules-language here is also kinda flawed, using terms like “give back” and, for example, this line “This allows a pilot to select a specific type of Int 15, Dex 15 vehicle and…“ – what? Pretty sure that those should be prerequisites… The rules-language here is really, really flawed and I frankly wished the page weren’t there. The piloting actions aren’t better, failing to specify their action type – this renders them unusable as written. From there, we move on to dumb bombs, oil spills etc., using damage as based on the size of the vehicle in question. Damage types are not properly noted here, and verbiage isn’t always perfect, but thankfully never reaches the levels of non-function of the one page of feats and piloting maneuvers. The final chapters are devoted to a massive selection of sample vehicles, as well as a brief summary on the topics of destroying/repairing vehicles. Editing and formatting are not as tight as this book deserves. Layout adheres to a nice two-column full-color standard and we get quite a few, detail-wise decent, but inspiring full-color artworks. The pdf comes with bookmarks for each chapter. 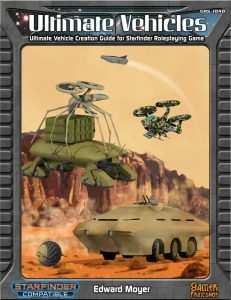 Edward Moyer’s Ultimate Vehicles is a truly fantastic little system that can provide a metric ton of crazy vehicles for your interstellar adventures. There is a ton to love about this book – so much, in fact, I’d consider it to be a best of candidate. Alas, this book is a good example for my claim that good editors/devs are the unsung heroes of the RPG-industry. The book, good news first, does not lack crucial components and presents a functional system. On the downside, though, the per se concise and well-presented rules are needlessly obtuse in some components. The inconsistencies between tier and item level; the fact that the rather important numerical values for sizes (size levels, as they’re called exactly once, a couple of chapters after being introduced) are not even bolded or otherwise emphasized or concisely defined with a unique term – this book, for the most part, manages to make the process of creating vehicles super-easy…only to become obtuse due to terminology inconsistency. I’ve had to skip back and forth a couple of times to get how the system works, and that is, in part, due to presentation and content editing snafus. In short: This book requires some tolerance regarding these problems. But if you *do* get past these issues, you’re rewarded with a phenomenal toolkit that can enrich your game for years. Once you get past the imperfections, you’re rewarded. The entry-barrier generated by the book can potentially sink this pdf for you – unless you’re willing to look past the flaws and invest time in understanding the engine presented here, you will not have fun with this. For the formal issues, I should rate this down further. If the quality of the crunch was as bad as for the feats and piloting skill uses, the only part herein that simply doesn’t work, I’d consider this to be bad. However, on the other hand, the book does deserve applause for what it does once you get how it’s supposed to work. Once you get it to function as it should, the book becomes amazing. And it doesn’t simply become a “bit” amazing, but rather, a MIGHTY, versatile toolkit you’ll adore. This is, then, ultimately the best definition of a diamond in the rough. It is needlessly VERY rough in its components. But it can shine. Oh, can it shine. As a reviewer, I am utterly torn. The formal criteria regarding rules-consistency, etc. are simply not met by this book; were I to rate this on smoothness of didactic rules presentation and consistency, I’d have to rate this seriously down to something in the vicinity of 2 stars. However, on the other hand, the book does not deserve being called bad; heck, it doesn’t even deserve being called mediocre – it is, potentially, a truly inspired gem of a book, a book that could have easily been a Top Ten contender. I am, truly and thoroughly, torn. If I rate this 3 stars, emphasizing the serious problems this has, I’d do the book a serious injustice; at the same time, if I do ignore the rather pronounced flaws this has, I’d be misleading the consumer. As a whole, I consider the flaws to be components that can be overcome, and with but one page of truly bad material in a book of this size and density, I feel justified in rating this 4 stars. You can get this diamond in the rough here on OBS! Genesys Core Rulebook (Genesys) Massive Product Updates!